Boy oh boy, I could not wait for a weekend like this. It’s the first time this year that my team, Kansas State, played at 11:00 in the morning. That means that I get to have the opportunity to have some tasty breakfast for this week’s Football Feedings. So many choices, so many different breakfast ideas. I landed on a good ole down home favorite: biscuits and gravy. But not just any kind of gravy. This was with sausage and bacon. Preheat oven to 425. Sift the flour, salt, baking powder, and sugar together. Cut shortening in with two knives or a pastry blender. Add milk and stir until dough forms a ball. Knead until dough is firm and then form into biscuit balls. Place together on baking sheet and bake for 15-20 minutes. Now on to the gravy. Fire up an iron skillet and slap on the bacon. Cook the bacon well, say 15 minutes flipping on medium-high fire. Once completed, put the bacon on a plate in the fridge. Without removing the bacon grease, slap on the package of breakfast sausage. Brown it well. Crumble up the bacon and put it back in the pan. Grind in black pepper and any other spice to your liking. 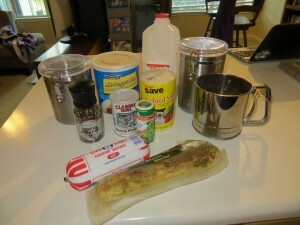 Now sift in a 1/2 cup of flour and about 1/2 cup of milk. Stir around until mixed. Sift in as much flour and milk until you begin to see some thickness evolve. Let it cook for about 5 minutes or until it’s as thick as you want. Pretty easy, right? 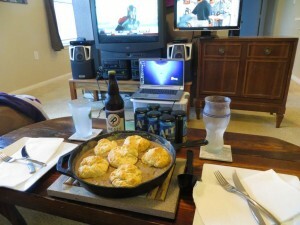 So I rocked the Hops & Grain Alternation Albier for the food. 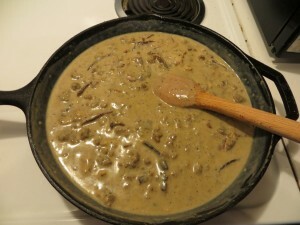 The spices from the altbier mixed wonderfully with the spices and the meaty flavor of the bacon and sausage gravy. The biscuits were just flaky enough to break up easy on a fork stab but solid enough to sop up the gravy. Man it filled me up so well and the beer woke me up just as well. I will say that the gravy could’ve been a little thinner but it’s more of a combination of grease and cooking time this go around. I’m not sure Kansas State will play again in the wee hours of the morning so this was my one shot at an awesome breakfast. I like to think I nailed it. Now if I ever find myself out in the field, the tailgating field, I know with my trusty skillet and bacon cooking skill that I can cut it. Perhaps I’ll put on an even bigger pair of big boy pants and cook with 3 meats instead of 2.